Last year Culinary Historians hosted Christy Rost who lives in Colorado and Texas. Anasazi beans were one of the few crops cultivated by the Anasazi Indians. Anasazi (ahn-a-sa-zee) is a Navajo word meaning "ancient ones." The Anasazi Indians are best identified for their architectual achievements known today as cliff dwellings and inhabited these structures as early as 130 AD. Today these structures can be seen of areas such as Masa Verde National Park, located in southwestern Colorado. These were excellent beans and indeed cooked fairly readily. James Hamblin at TheAtlantic.com wrote: Recently [Helen] Harwatt and a team of scientists from Oregon State University, Bard College, and Loma Linda University calculated just what would happen if every American made one dietary change: substituting beans for beef. 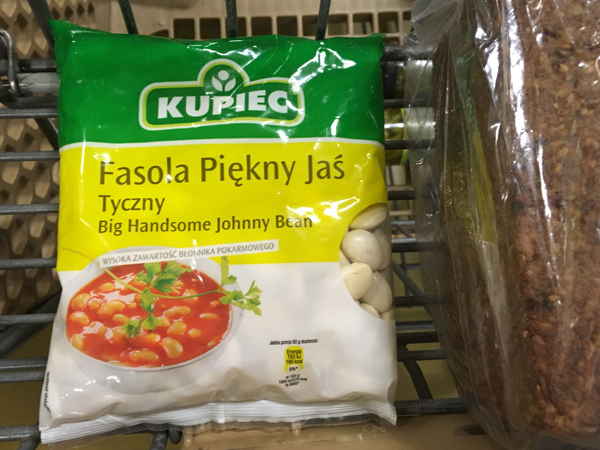 Don't forget the Big Handsome Johnny Beans! Every well-curated collection of artisinal legumes must include a bag or two. Find 'em at Polish markets. Cooked up a batch of RG black eyed peas for New Year's Day today, and they are delicious. Absolutely worth the work and price. There's a very informative and well-written piece about RG's role in boosting the humble bean, posted at the New Yorker's website . . .
at NewYorker.com, Burkhard Bilger wrote: I thought about that meal last spring, when I first met Steve Sando. We were standing at a table heaped with hibiscus flowers, at an outdoor market in the town of Ixmiquilpan, three hours north of Mexico City in the state of Hidalgo. It was a Thursday morning in May, and the stalls were full of women gossiping and picking through produce: corn fungus and cactus paddles, purslane and pickling lime, agave buds and papalo leaf that smelled of mint and gasoline. Sando, who is fifty-eight, ambled among them in a white guayabera shirt, untucked at the waist. He had on loose jeans, tennis shoes, and a bright-red baseball cap that said “Rancho Gordo” above the bill. He could hardly have looked more American, yet he fit in perfectly somehow. He was built like a giant bean. That may seem too easy, beans being Sando’s business. But people are often shaped by their obsessions, and in Sando’s case the similarities are hard to miss. His body is mostly torso, his skin both ruddy and tanned, like a pinto. He makes a colorful first impression, gets a little starchy if you crowd him, then slowly softens up. Fifteen years ago, when Sando founded Rancho Gordo, he had no food-retailing or farming experience. Now he’s the country’s largest retailer of heirloom beans and a minor celebrity in the culinary world. He’s a side dish who’s become a staple. Proprietor Steve Sando sent out a thoughtful email missive earlier today that I thought applied to many of us here . . .
in an email, Steve Sando wrote: You may not realize it but as time marches on, we home cooks are becoming rarer and rarer. The fact that we get excited about a new bean, a cooking pot, or even a new wooden spoon, puts us in the minority. Most of us think of cooking as fun and a great way to bring people we care about together. We see a pound of beans and we imagine how we’ll be cooking them, how we’ll be serving them, and maybe the smiling faces that will be eating them. I have a constant vision of leaving the kitchen and walking towards the dining room table with a huge pot of something good between my hands as I ask for help finding a trivet. This is possibly my favorite moment of the day. I try and do it most nights. I know that we home cooks are a dying breed, but I also feel like the resources for those of us deep into the hobby (can I call it that now?) dwarf those available at any previous point in history. I can source even exotic Asian ingredients readily. There are so many internet resources for scientific cooking and every ethnic cuisine you could possibly want to eat. The tools available to us are state-of-the-art. I use commercial ice cream stabilizers to make great textured ice cream with clean flavors, a sous vide machine to make perfectly poached chicken breast and a pressure cooker to churn out great stocks in record time. Of all the times for home cooking to die, it shouldn't be now! botd wrote: I know that we home cooks are a dying breed, but I also feel like the resources for those of us deep into the hobby (can I call it that now?) dwarf those available at any previous point in history. I can source even exotic Asian ingredients readily. There are so many internet resources for scientific cooking and every ethnic cuisine you could possibly want to eat. The tools available to us are state-of-the-art. I use commercial ice cream stabilizers to make great textured ice cream with clean flavors, a sous vide machine to make perfectly poached chicken breast and a pressure cooker to churn out great stocks in record time. Of all the times for home cooking to die, it shouldn't be now! Well, is there ever really a good time for that? The death of home cooking will always be a brutally depressing prospect. I agree with you about the breadth, depth and ease of availability we home cooks enjoy when it comes to ingredients, supplies and culinary tools. If there's a negative, it's mainly my guilt when I take the online route by default rather than seeking a local source. But especially in cases when I have some lead time, ordering online leaves so much time for other tasks and responsibilities, it's often hard to resist. This is getting off the topic of beans, of course, but I find a set of leftovers / stocking up in the fridge is a recipe (heh) for waste: we just don't want to riff on the same set of ingredients several times in the same week. But the freezer is our larder for that: any large roasted/smoked/braised meat gets packed into two-serving vacuum aliquots. Veggies less often, and I need to remember to save more of the stock/soup/sauce things in smaller containers. But right now, I have a fridge containing stable items such as nam prik pao, pickled red onions, home-fermented ghost chile hot sauce, and a few other things -- some of which may have gone way past peak. But I don't see home cooking failing. Yes I have friends who do mealpacks, but they're doing it as novelty, learning new dishes where they wouldn't have been that adventurous. My sons and their wives cook much more frequently than eating out, and they're stealing whole holidays from me now that they have their own place. Good Eats is coming back. Molto Mario was going to but for a clog-wearing troglodyte's behavior. Scripps Networks ought to renegotiate where its channels appear -- Cooking Network seems to always be on more premium packages and not the base, and it's a shame. Do you discard the veg after cooking or does it retain some flavor? I never discard them. They just become part of the pot liquor.